NEW IN-STORE: KM Natural lipstick - NOTHING NASTY TOUCHES MY LIPS! - Live It. Do It. NEW IN-STORE: KM Natural lipstick – NOTHING NASTY TOUCHES MY LIPS! 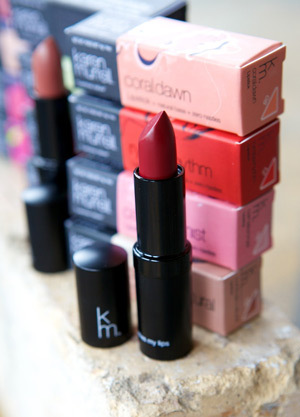 Guest post by Karen Murrell from KM Natural Lipsticks. A woman consumes an average of nearly two kilograms of lipstick during her lifetime through drinking, eating and kissing – so keep lipstick natural! Wearing of lipstick is as old as ancient Egyptian times. Cleopatra used crushed carmine beetles which gave a rich, deep red appearance to her lips. It was the French however, in the late 1800’s who popularised lipstick for the masses. I have always had a love of colour cosmetics. I started by cutting my teeth formulating skincare and during that time I wanted to bring ladies a natural lipstick that was environmentally friendly yet functionally as good as any top international brand. Making lipsticks is a profession; and it takes time, experience, creativity and scientific process to get it right. When I make my lipsticks there are two key things which I consider; the formula, and the colour shade. An important part of my philosophy is to stick to natural ingredients that promote healthier benefits, whilst at the same time, they are better for the environment as a whole. The base ingredients; such as beeswax have been used since the 19th century French lipstick makers (perfumers), but I have updated my ingredients to include natural extracts that are safe, resourced responsible, and simply taste and smell better. To design a new range, I am very much influenced in the same way an artist might be; by seasons, natural objects, plant and animal life, music, Literature, fashion, my (and other people’s) moods. In fact pretty much everything! I wouldn’t necessarily call myself an artist of course but when people ask me how I go about designing lipstick, I generally answer by saying it’s a combination of my knowledge built up over many, many years and allowing myself time to think creatively. The most amount of time though, is often taken up by sourcing ingredients, registration and compliance, packaging design, and marketing. But I love it all and feel honored to think that I might be helping every Cleopatra out there to find their own Antony! KM Lipsticks are made totally of natural ingredients. They do not contain any mineral oils, animal-based material, parabens or preservatives. And because of the fusion of Mother Nature’s miracle ingredients, the more you use KM Lipstick the better condition your lips will be in. This high-quality formulation means KM Lipsticks are long lasting on lips, and they smell and taste great. The packaging of the KM range, with its original artwork, has been designed with sustainability at the forefront. The outer packaging is a 100% recyclable and renewable box made from New Zealand trees and printed with soya ink. KM NATURAL LIPSTICKS ARE NOW AVAILABLE HERE AT http:shop.chooselifeliveitdoit.com and THEY ARE WAYYYYYYYYY GORGEOUS! WEARING: the belly @ 25 weeks + some really comfy JEANS!